You're my sunshine floral wreath builder card. 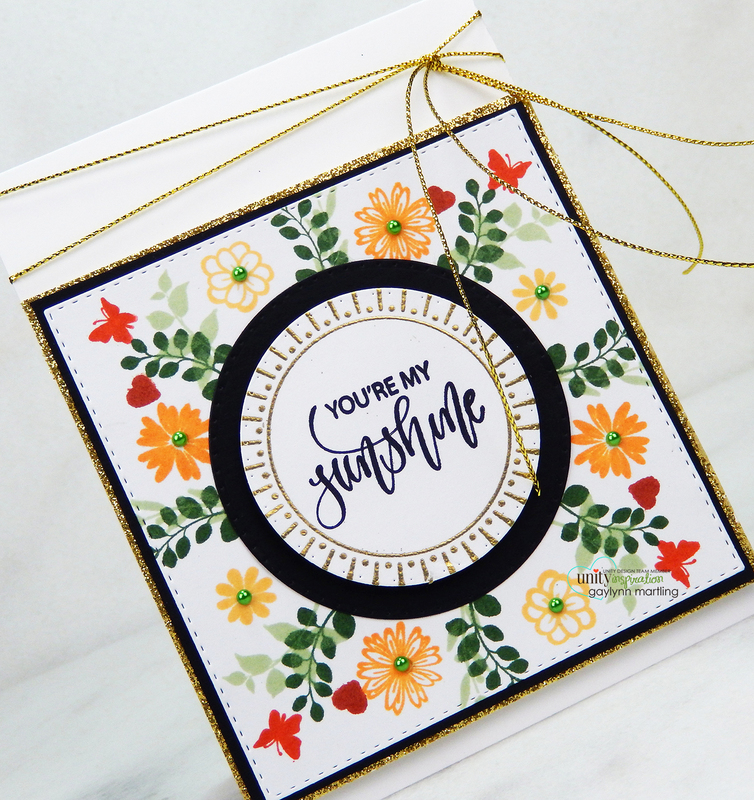 Today, I am sharing an uplifting card featuring sweet flowers and leaves. I am showcasing a wreath building card making technique. Using the Gina K. Designs wreath builder stencil, one 4"x4" piece of cardstock and the original Misti, repeat stamping was added. By rotating the paper over and over with stamping, it creates a perfect wreath design. The options of stamps and styles are endless. I chose a wispy look to the leaves and flowers with different ink colors. 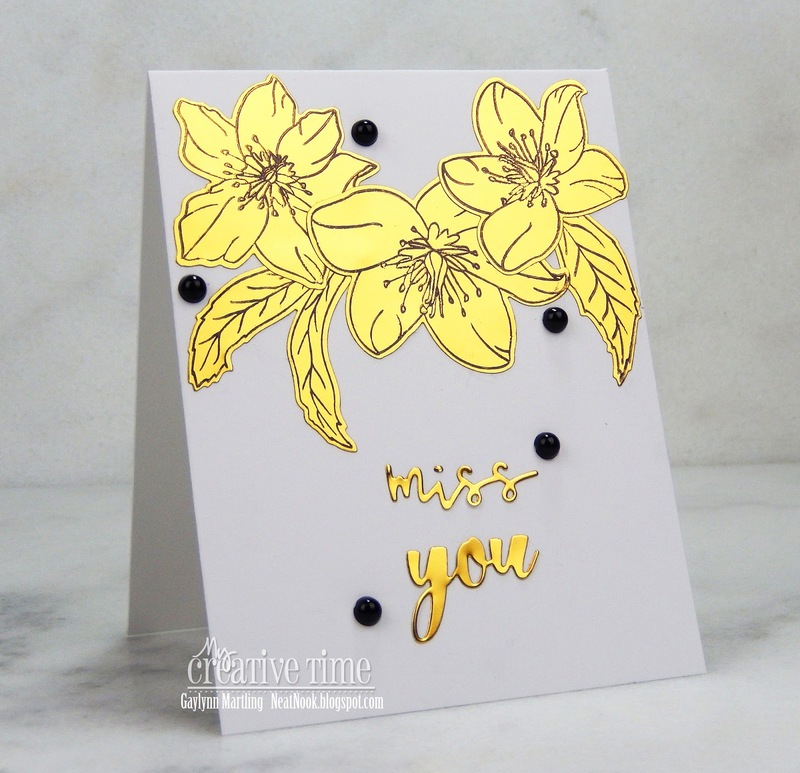 The center sentiment frame was heat embossed in gold and then die-cut. Everything was layered in black with gold glitter trim. Supplies: Unity Stamp Co. Circle of Friendship by Gina K. Designs and Wreath Builder template; My Creative Time stitched square dies inside and out and bunch of fun circle dies; Ranger archival ink in jet black, olive, sap green, venetian orange, sienna, monarch orange and pale ochre; Scrapbook adhesives E-Z Dots repositionable adhesive; gold embossing powder, glitter paper and cording. 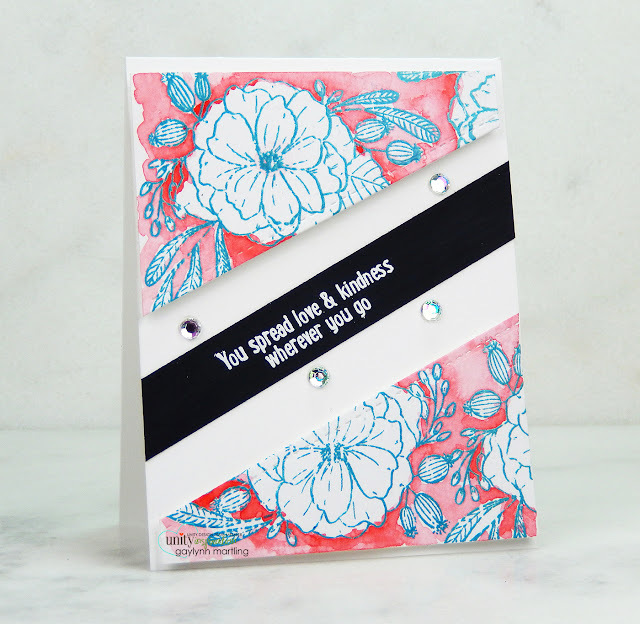 Floral tie dye watercolor card with stamping. 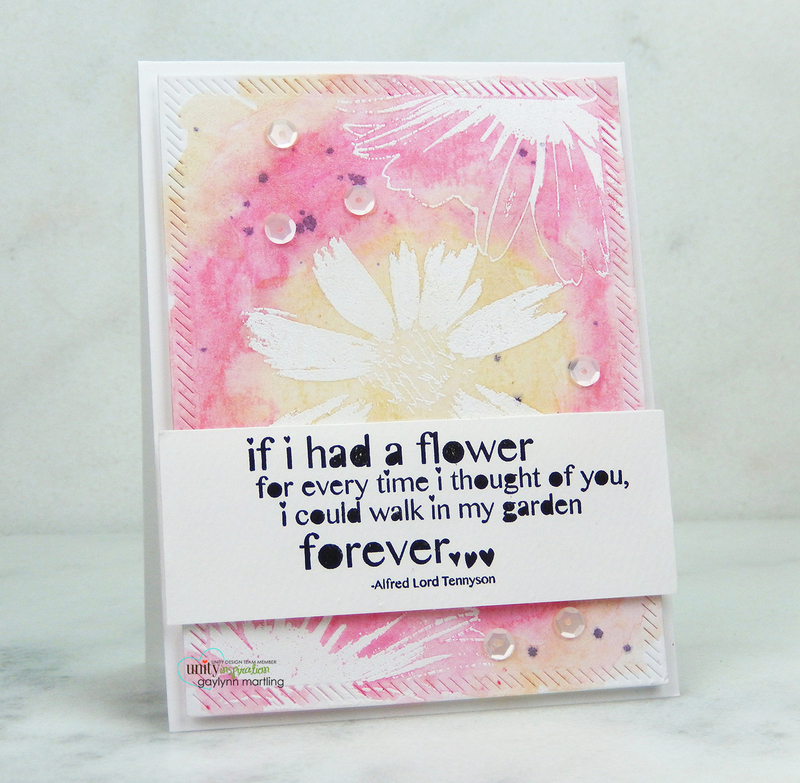 It is Watercolor Wednesday and I am sharing a way to get the look of tie dye watercolor with card making. This card was stamped and heat embossed in preparation for watercolor. I used gelato color for watercolor. The look of soft tie dye was what I was going for. The result left a beautiful pastel shimmer to the card. Supplies: Unity Stamp Co. Cluster Of Buds stamps; Faber-Castell Gelato, Ranger watercolor paper, wide water brush and embossing powder; VersaMark watermark ink, heat tool and sequins. Hello country mouse greeting card. 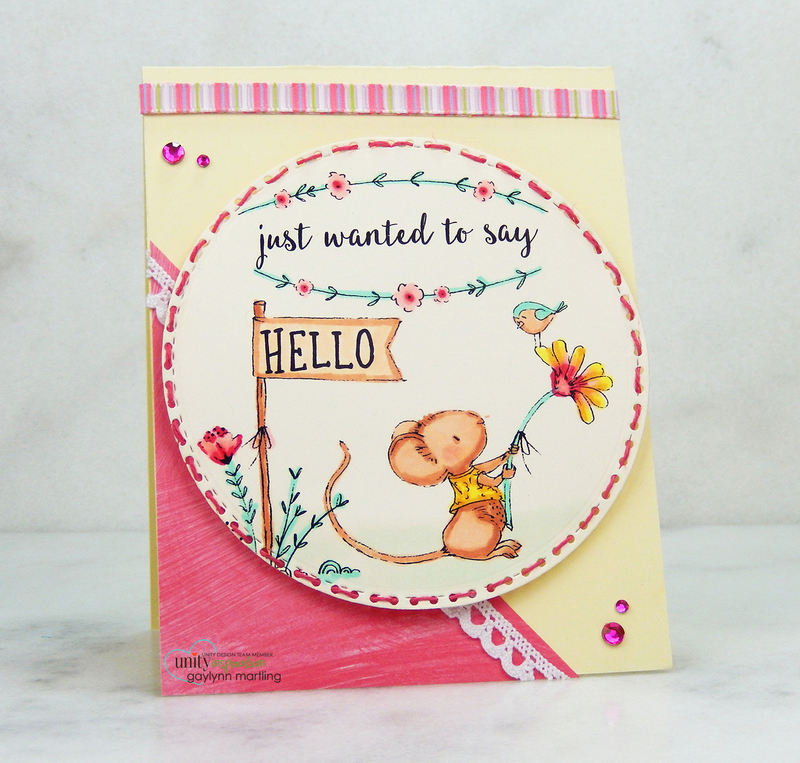 Today, I am sharing this sweet all occasion card featuring the cutest little mouse in a garden scene. Sentiment: Just wanted to say hello. The mouse is just too cute, and then all of the little garden details make it even sweeter. I decided to use soft Copics for the scene and then add hand stitched details around the edge. I used shades of pink and ivory, mostly. 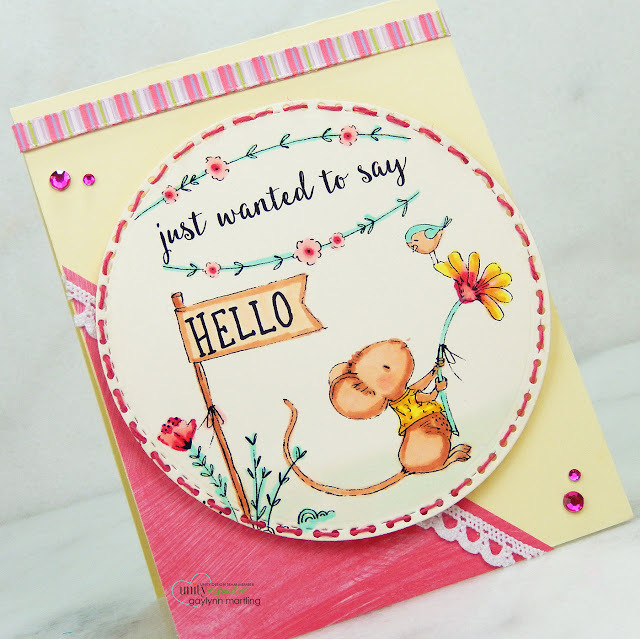 Supplies: Unity Stamp Co. Country Mouse Hello by Lisa Glanz, MFT die-namics, twine, lace, ribbon, adhesive gems and Copic markers W00, Y0000, G0000, YG0000, RV29, R32, R20, Y02, YR23, BG32, E00, E11, E15, E13. Hello, Gaylynn here. It is the MCT 86th Edition release, sale and blog hop. Here is an elegant take on these beautiful flowers and sentiments. For this amazing release, I am using something from each of the new kits. I decided to use only stamping and die-cuts along with peel away gold adhesive foil. The florals will work with most any sentiment. 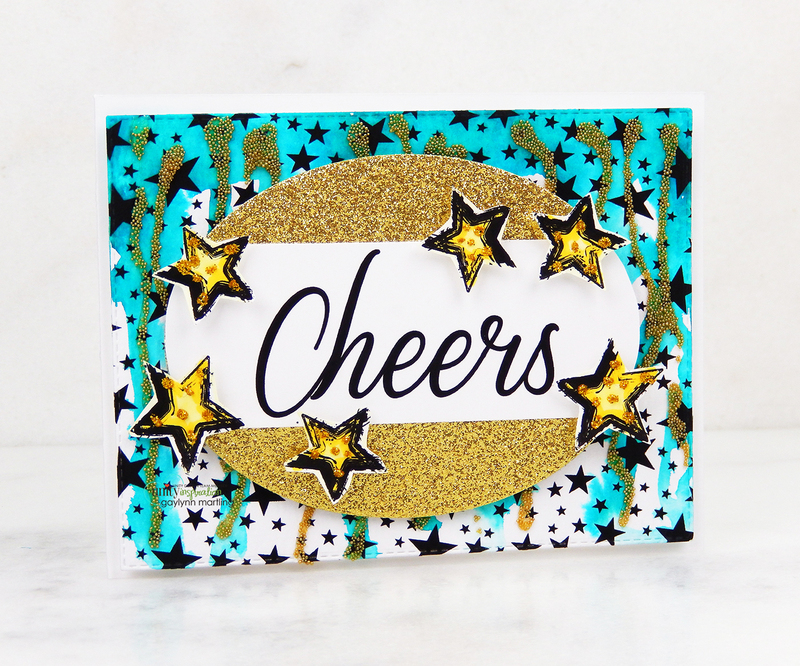 The gold makes it shine beautifully, giving an elegant look to this clean and simple card. ALSO, DON'T FORGET our sale starts RIGHT NOW here:http://shop.my-creative-time.com/Ne...! Use the code: DEC2018 to receive a 15% discount off your entire purchase! This sale applies to "IN-STOCK" items ONLY. This sale will end on Friday, December 28th, 2018 @midnight PST. Starting today... Friday, December 21, 2018 at 8am PST we will be giving away this ADORABLE new "You Dies #1". This new die set will be given to the FIRST 25 shoppers! If you are one of the 1st 25 shoppers it will automatically be added to your package at the time of packing/shipping. Once 25 shoppers come through, this stamp set will be available for purchase! So, if it's available in the store, you are not one of the 25. No exceptions will be made. This freebie is not part of the "Bundle" and will be sold separately! P.S. Emma wanted you all to know that she updated her "OVERSTOCK Sale Items" category in her store along with LOTS of "RETIRED PRODUCTS". Yep, she also updated the "RETIRED PRODUCTS" category as well! Everything is already marked down now, SO if you have been wanting a particular set, you might want to take a look! Especially since a handful of the retired items she only has 1 OR 2 sets left! Beginning today, you can use the discount code off of the already low price! Just keep in mind, if you want to take advantage to get what you really want, you might want to shop early! Here are my sneak peek blog projects from this release. 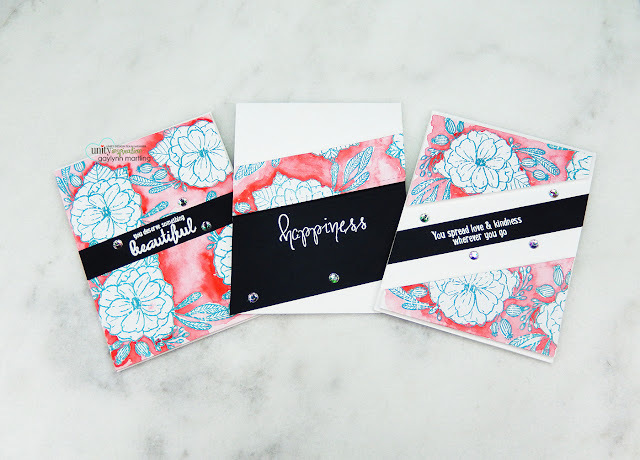 This week, I shared three totally different ways to use these florals and sentiments. Supplies: My Creative Time Amazing stamps and dies, You Dies #1, You Dies #2, Silhouette gold adhesive foil sheets, Ranger jet black archival ink, original misti and black adhesive pearls. Hi there. The MCT team is sharing Day 2 sneak peeks of the 86th Edition release. 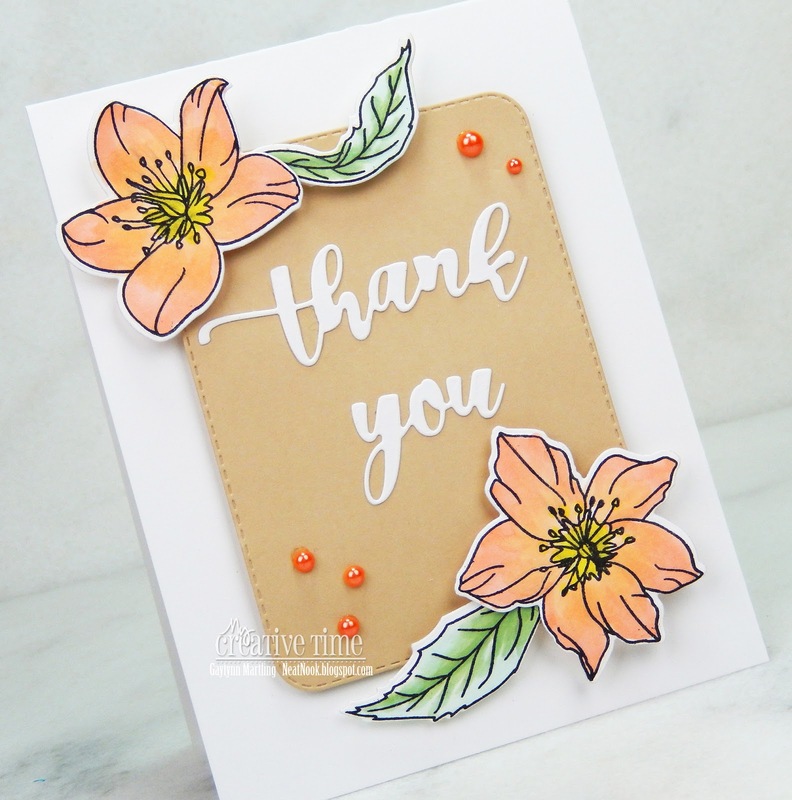 For this thank you card I stamped, colored and then die-cut the flowers to use as accents. 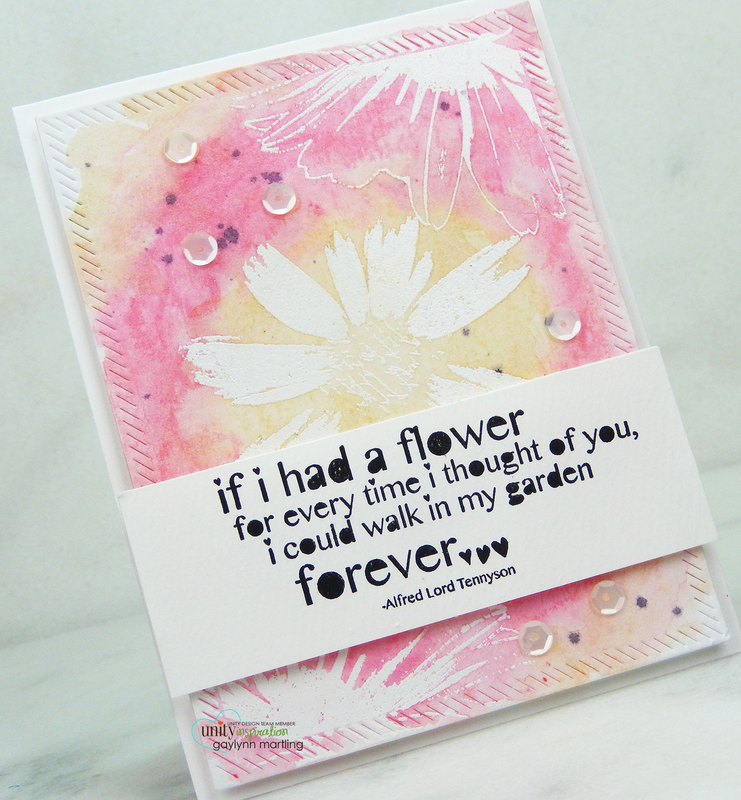 The sentiment and background panel were also die-cut and added between the florals. Copics were used along with a few adhesive pearls. We will be giving away the sets we are showcasing each day to ONE lucky winner! For example, the set we are showcasing on Wednesday, Emma will announce the winner of that on Thursday and the sets we are showcasing on Thursday, Emma will announce that winner on Friday on my blog! ALL you have to do is leave a comment on each of our blogs! You are NOT required to comment on EVERY SINGLE blog, but the more you comment on, the more chances you have for winning! VERY IMPORTANT, PLEASE leave a way for us to contact you with your comment just in case "YOU" are the lucky winner! For EXTRA entries, you can spread the word about this release on Facebook, tweet about it OR even instagram it! #mycreativetime! GOOD LUCK EVERYONE and let's start spreading the word! P.S. Emma wanted you all to know that she updated her "OVERSTOCK Sale Items" category in her store along with LOTS of "RETIRED PRODUCTS". Yep, she also updated the "RETIRED PRODUCTS" category as well! Everything is already marked down now, SO if you have been wanting a particular set, you might want to take a look! Especially since a handful of the retired items she only has 1 OR 2 sets left! OR you can wait for Friday so you can use the discount code off of the already low price! Just keep in mind, if you want to take advantage to get what you really want, you might want to shop early! Supplies: My Creative Time You Dies #2, Amazing stamps and dies and Stitched Journal Die; Simon Says Stamp intense black ink, Mini Misti, Copics G0000, G21, Y02, Y21, YR00, R02. For Watercolor Wednesday, I created an uplifting pear card using a spotlight watercolor technique. This card background was stamped in gray with a little masking using the stamp backing paper. 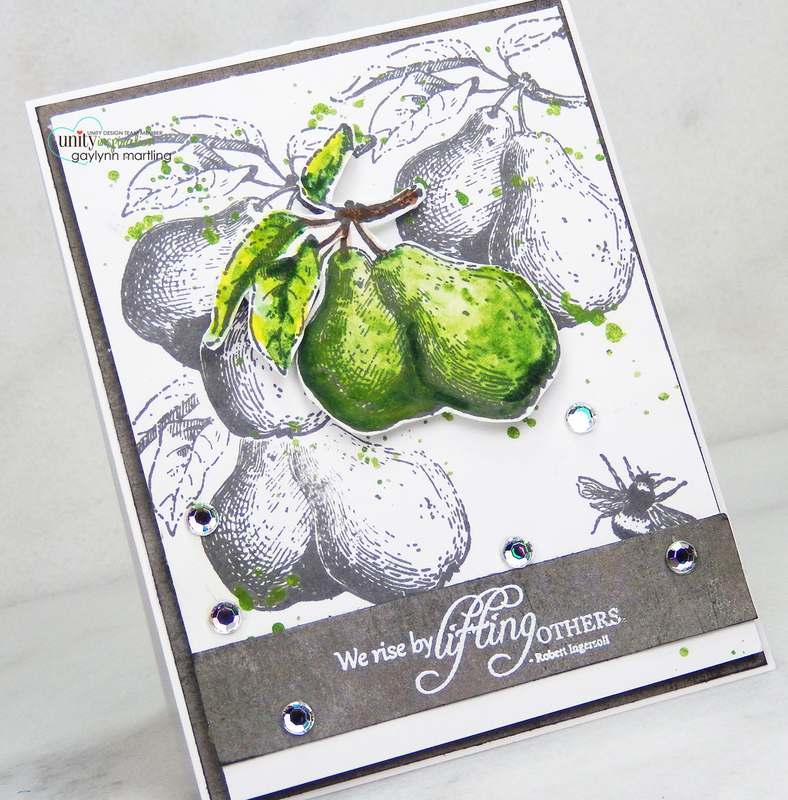 The top pear was given watercolor in shades of green and then fussy cut for accent. 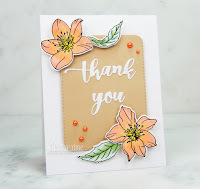 Supplies: Unity Stamp Co. Sending Kindness by Graciellie Design; Altenew watercolor half pans, Ranger watercolor paper, embossing powder and watering can archival ink; VersaMark, heat tool and adhesive gems. Hi there. The MCT team is sharing Day 1 sneak peeks of the 86th Edition release. Sentiment: Keep on being amazing! This card was created by heat embossing the flowers in the background as well as the sentiment. The flowers are so pretty that coloring is not necessary. I just added a bit of crinkle ribbon and a sentiment panel to finish. Supplies: My Creative Time Amazing stamps and dies; Versamark ink, embossing powder, crinkle ribbon and Misti. 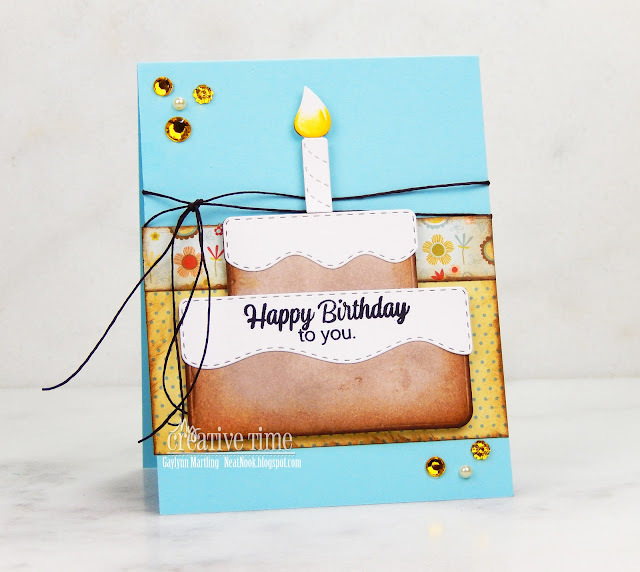 Today, the My Creative Time team is sharing birthday projects. Here is a birthday cake card with die-cuts and stamping. I used distress ink around the cake and paper trimmings. Then, of course, added embellishments and twine. Supplies: My Creative Time Birthday Cake Die, Time To Celebrate and Metal Adaptor Plate; Sizzix Big Shot, Ranger archival ink and distress ink; adhesive gems, twine and My Mind's Eye paper. Handmade patterned paper~ 3 watercolor floral cards from 1 panel. 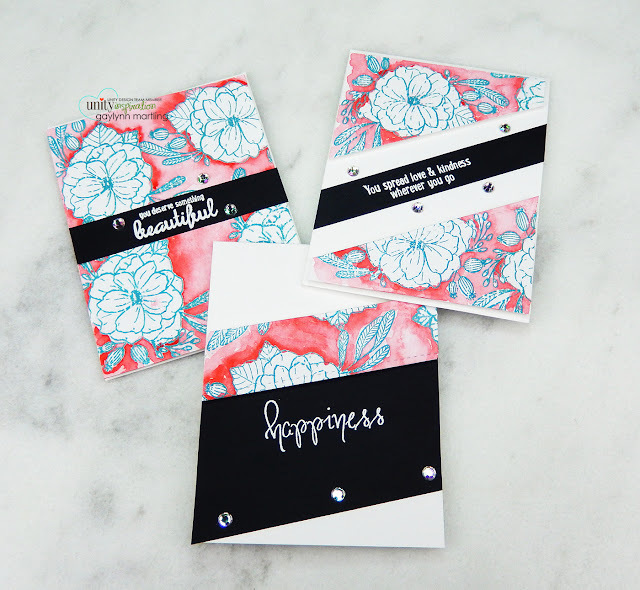 For Watercolor Wednesday and I made three floral watercolor cards from one sheet of stamping. 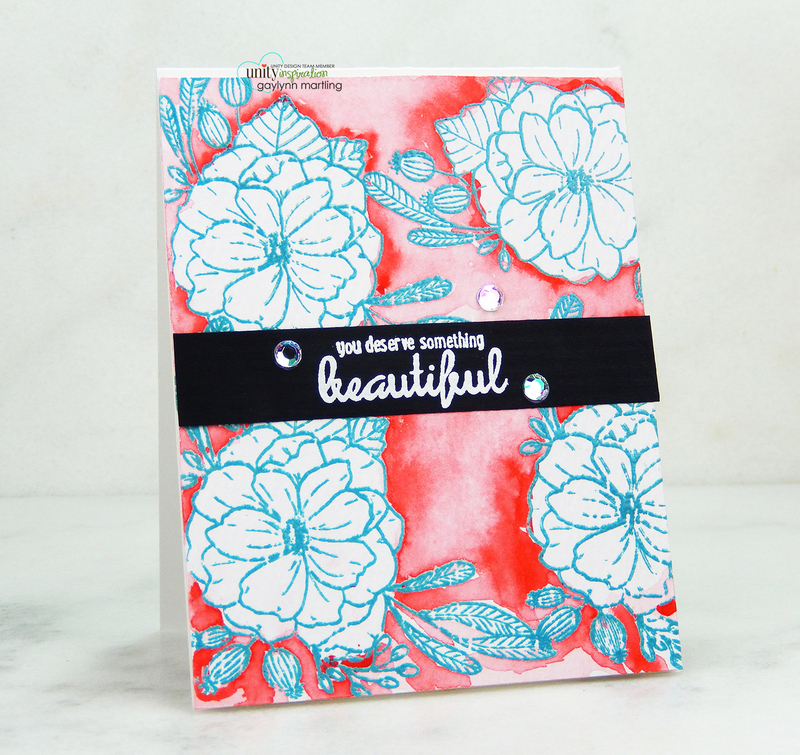 This is a fun way to create your own watercolor patterned paper designs. You spread love & kindness wherever you go. Sometimes I like to make my own patterned paper. 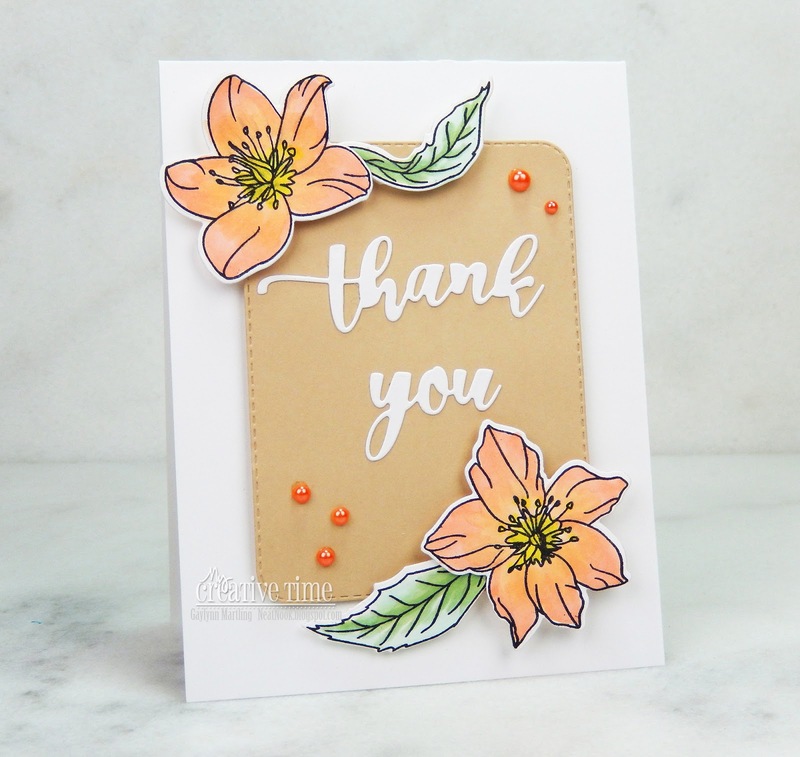 For these cards, I made a half sheet of floral watercolor flowers with embossed stamping. It was easy to watercolor, trim and then assemble for three different card designs. For this card, I trimmed for an A2 size background panel. 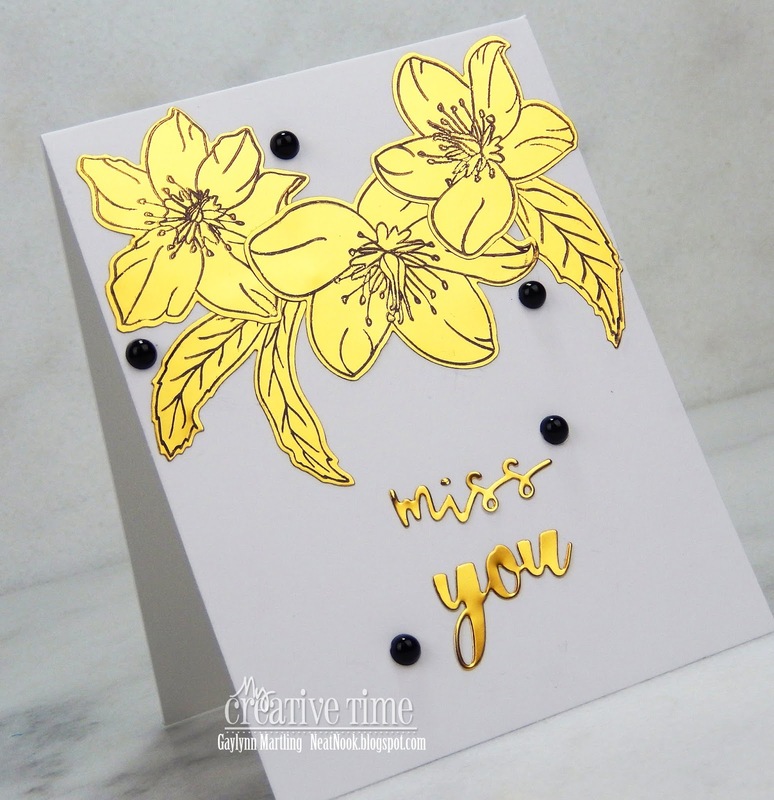 A diagonal strip of the florals was added to a wider sentiment panel for this design. 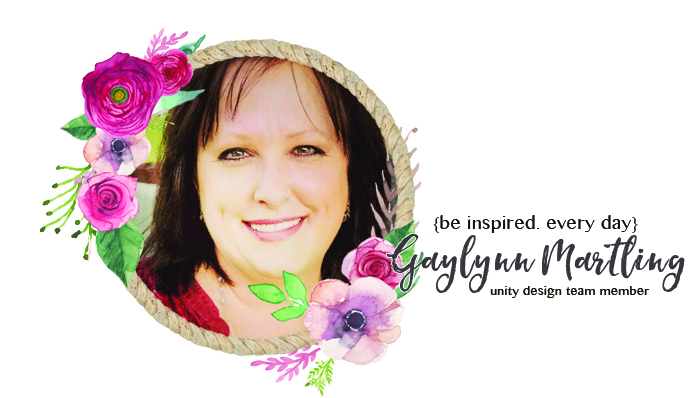 I used the diagonal corners to create this design, with the sentiment in the center. Supplies: Unity Stamp Co. Blossoming Beauty by Holly Hoffman; Altenew watercolor half pans, Ranger watercolor paper and embossing powder; ColorBox ink, Tim Holtz distress embossing ink, heat tool and Lil' Inker Designs dies. Today, the My Creative Time team is sharing "made in minutes" projects. I decided to make use of a few leftover die-cut pieces to speed up the card making process. Sentiment: Wishing you a year of happiness & love. This one was made in less than ten minutes. I had a leftover kraft color trim panel and hearts in vellum and white. I die-cut some leaves and a label panel and added a stamped sentiment. This card is great for a birthday or anniversary, I think. 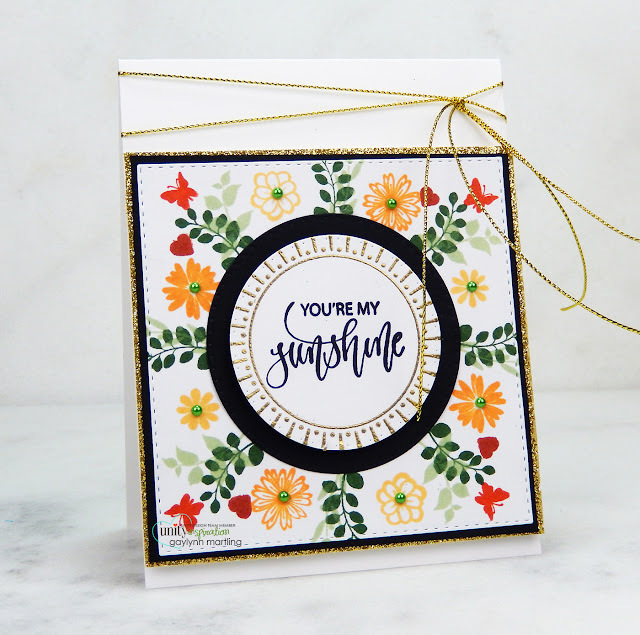 Supplies: My Creative Time Vintage Stitched Label Dies, More Scalloped Heart Dies, More Stitched Edges, Stitched Sweathearts & XOXO Dies, Summer Vibes, cardstock, vellum and adhesive gems. 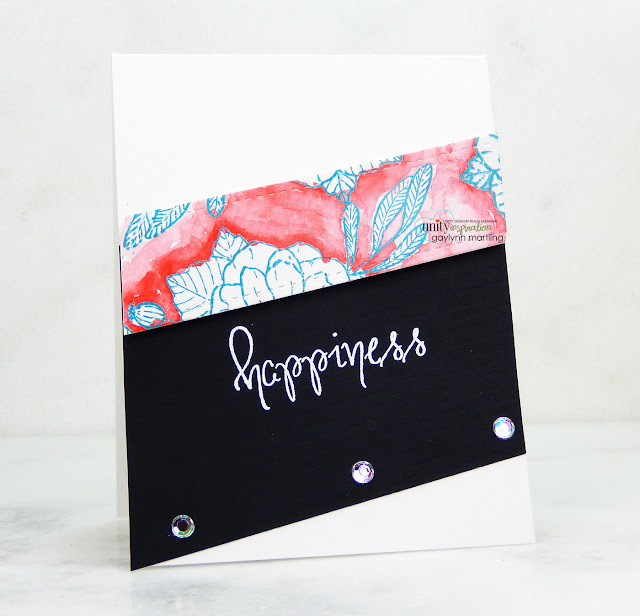 Ink spray watercolor with microbeads celebration card. 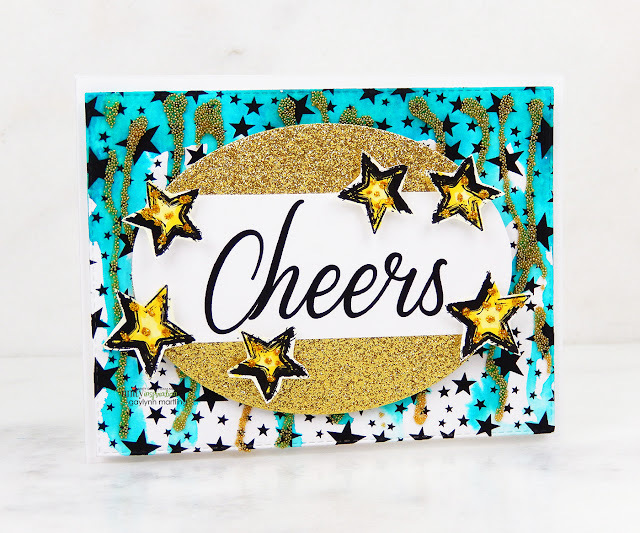 It is Watercolor Wednesday and I am sharing a celebration card with the look of streamers. This is great for birthday, New Years or most any celebration occasion. 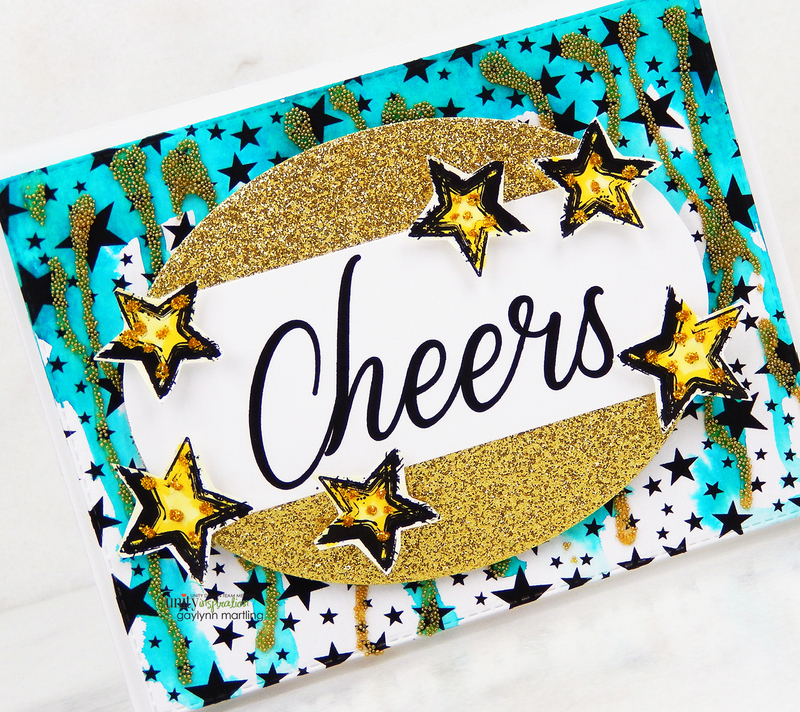 Supplies: Unity Stamp Co. Star Burst Background, Looking Up and Whole Lot Of Lovely KOTM; Ranger watercolor paper and archival ink; MSC gold microbeads, Glossy Accents, gold glitter glue, Dylusions Ink Spray in vibrant turquoise, heat tool and My Creative Time dies. Christmas holiday believe handmade gift tag. Today, the My Creative Time team is sharing various holiday projects. 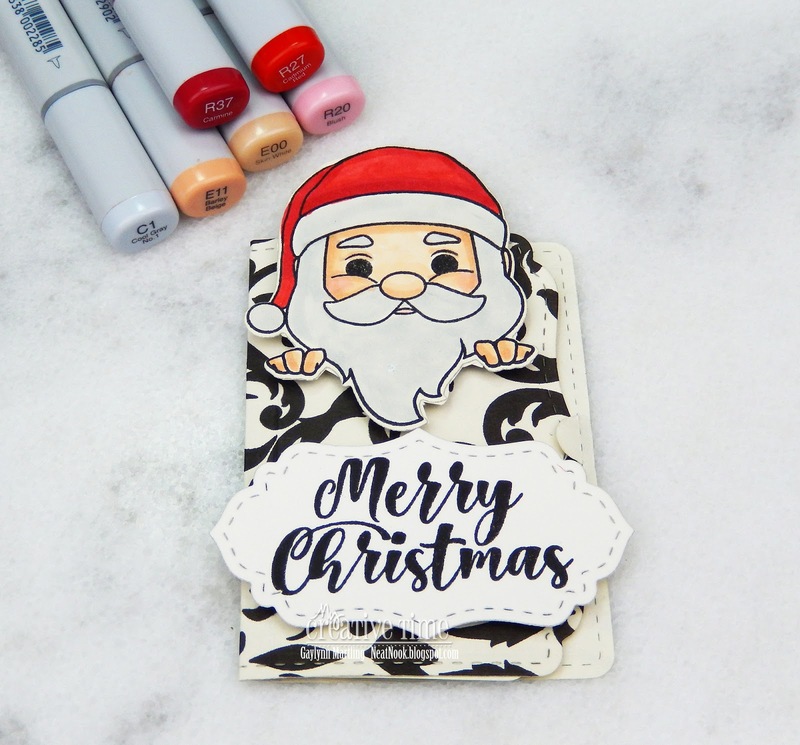 I decided to make another Christmas gift tag, because you can never have too many of those. This was easy to do. 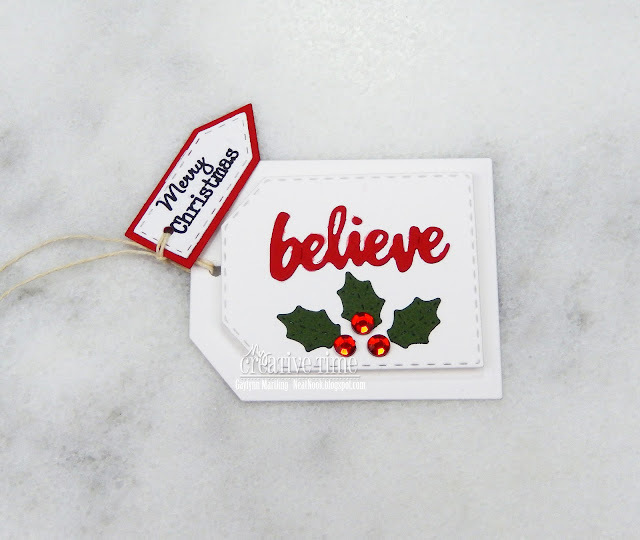 I just die-cut tags in layers, cut the embellishments and stamped a tiny sentiment. Red adhesive gems added the perfect finish. The thing that I like most about creating with MCT is the ease of layering the die-cuts that Emma creates and the selection of clear stamps that she offers. Supplies: My Creative Time Holiday Tags Stamp & Die Set, Chunky Stitched Tag Dies, Teeny Tag Layering Dies, Teeny Tag Holidays, cardstock and adhesive gems.